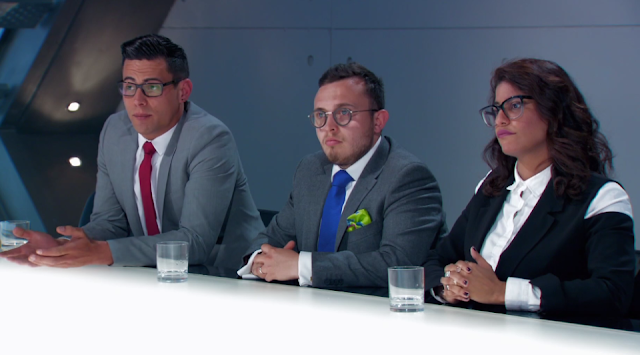 The Custard TV: The dog poo hits the fan for 3 Apprentice Candidates. The dog poo hits the fan for 3 Apprentice Candidates. This week the remaining candidates had to take over a ‘doggy day care centre’. Once again, team vitality snubbed Anisa and chose Charles for project manager. Team graphene chose James once again, but after a disaster last week this was a risky choice. Anisa being snubbed by the team I understand after her performance last week, but Charles choosing Andrew as subteam leader who has no experience with dogs? I’m slowly losing faith in my favourite to win the series. Both teams this week decided to go for the spa. However, the manager of the spa felt that Joanna’s attitude towards dogs didn’t reflect the team graphene’s enthusiasm and so because of this they were left with the agility course. On the pitch Andrew managed to mortify the rest of team vitality by swearing in front of the owner of the location, meaning the team only managed to negotiate a £120 price. Though Charles stations Michaela on phone sales, it doesn’t seem to go well and instead Elizabeth and Joanna manage to reel in the customers with their low price for agility training. In a surprising turn of the tables, James’ Graphene didn’t manage to get the spa. Team Vitality tried to propose a £420 price for a photoshoot, that went straight down to £200 at a push from the photographer. I can’t help but feel that no one in this competition is capable of being Lord Sugar’s business partner. As the ‘underdogs’ Graphene attempted to raise the price of Elizabeth’s agility classes, having lost the spa opportunity. They may have won the opportunity for the photography session, but having upped the price of Elizabeth’s agility course by £20, it shows a sincere amount of poor planning on James part. Unlike Graphene, Michaela was left having to try to fill out their appointments, after a failure to maximise. One thing was for sure this week, it felt like both teams were neck and neck trying to win the task, but both were embarrassing. Sarah’s agreement to pick up bird poo as well as dog poo only caused an uproar with the rest of team Vitality. Last time I checked picking up poo wasn’t rocket science, and from a team of dog lovers I expected more for definite. Team Vitality were as Karen put it ‘Led by Michaela’ I forgot at times Charles existed. Sometimes Michaela might emit a slightly aggressive aura, but she got what was asked of her done. In my opinion she was this week’s best candidate without a shadow of a doubt. James’ photography skills were almost as bad as Sajan’s directing last week, for someone who earns over £200,000 a year you would expect him to know how to market a jumper for charity. Vitality’s effort wasn’t much cop either. A stern look from a customer who’d paid over £120 for her dogs to be photographed, that was instead met by laughter says a lot about the candidates. In the boardroom, Lord Sugar was not impressed by Vitality’s choice to spend more time picking up the bird poo. Anisa the sub team made all the excuses they could, but earning £15 below their expected price was not acceptable. Graphene was not safe from fire though, with James’ choice to increase the price of Elizabeth’s agility class. As Lord Sugar called it, James leadership this week was ‘a big big mistake’. I was inclined to agree with, because I felt like his team won by the skin of their teeth. Though Graphene won by a significant margin it could have been either team this week for sure, the candidates this year are a joke. Charles as project manager chose to bring back Andrew and Anisa and it was clear that any of the three could be fired. None of the three candidates deserved to be in the competition after their performance this week, and as Lord Sugar explained ‘It’s time to be serious’. Each of the candidates had a clear attitude problem, and had failed to take on board the past feedback from Lord Sugar. Both Andrew and Anisa said that Charles should be fired, but both showed clearly this week how amateurish they were. Rightly so, the pair were fired from the competition, but not without clueless project manager Charles. The climax of this week’s episode didn’t shock me in the slightest. Lord Sugar said himself that he ‘couldn’t envision any of the three being his business partner’. The race to be his business partner continues, but who the victor will be is still unclear.